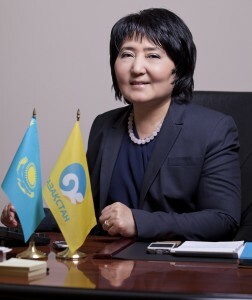 Nurzhan Mukhamejanova was born on February 12, 1961, in Almaty Region, Kazakhstan. In 1982 she graduated from S.M.Kirov Kazakhstan State University majoring in journalism. During 1983-1992 she worked as a journalist, editor and editor-in-chief in different Kazakh radio shows. In 1992-1994 Deputy General Manager on a Kazakh radio station. Between 1994 and 1996 worked as political analyst on a Kazakh radio station. During 1996-1997 worked in the press service of the President of the Republic of Kazakhstan. In 1997 was head of on-line information service on a Kazakh radio station. In 1997-2006 worked as a Deputy Director and Executive Director of Internews-Kazakhstan nongovernmental and noncommercial organization. During 2006-2011 was Deputy Director General in Channel 31 TRC ltd. Since 2011 became CEO in JSC Kazakhstan Republican TV & Radio Corp.
Nurzhan Mukhamejanova is native Kazakh and speaks fluent Russian and Turkish.